Back by popular demand and after a successful 10 years of existence, Supersonic Festival returns and Capsule are taking the event back to its core values by curating ‘Supersonic Festival Ltd Edtn’ an intimate two day event. On 30th and 31st May, it shall return to the Custard Factory, Birmingham where it all began. As this is a limited event, there are only 400 weekend tickets available and they will be going on sale on Friday morning at 10am, so grab them while you can via the www.theticketsellers.co.uk. Already confirmed the billing for the event, which will take place at a new space within the Custard Factory, Capsule are delighted to welcome back SWANS. Michael Gira, Norman Westberg, Christoph Hahn, Phil Puleo, Thor Harris and Christopher Pravdica are no strangers to Supersonic Festival, and are thrilled to play host to their infamous, dominant and strikingly powerful live show. Baltimore duo MATMOS shall bring their dizzyingly diverse assemblage to Supersonic Limited in support of their 2013 album. Their music comprises stomping techno, eerie synth jams, musique concrete, Latin rhythms, and Ethiopian music, at once at home in the academy, the art gallery, the nightclub and the noise warehouse, perfect fit for the festival then. Liverpool based ensemble, Ex Easter Island Head, will bring their expanded LARGE ELECTRIC ENSEMBLE which includes twelve prepared electric guitars and drums to create a maximalist wash of amplified strings and droning overtones. The ensemble adopt a new vocabulary of playing based around various guitar preparations, from billowing harp-like arpeggios to ‘bowing’ the strings with allen keys to produce luminous upper register drones. Microtonal intervals create shimmering tones akin to the struck metallophones of Balinese gamelan, whilst the thrum of electrified strings creates a dense undertow of singing harmonies. Capsule are also pleased to welcome back, the infamous blistering noise of WOLF EYES. From touring with Sonic Youth and Andrew W.K., WOLF EYES have crossed borders into popularity which few other such confrontational units of their ilk have been able to and kept straight and narrow on their blazing path, and are on top form. The overwhelming force of Wolf Eyes must be seen to to be believed. Also returning to the festival, is French artist AGATHE MAX. With an elegant command of melody and a strident use of rhythm, AGATHE MAX creates dynamic, fast-flowing loop pieces that encompass noise, post-classicism and krautrock with nods to the High Lonesome Raga as filtered through Henry Flynt. Finally, provocative Norwegian singer, composer, lyricist and writer JENNY HVAL shall perform at Supersonic. Multidisciplinary and transgressive are words often employed to describe her art, but JENNY HVAL’s polyphonic artistry is in fact seamlessly interwoven between musical, literary, visual and performative modes of expression. Despite her young age, she has already infused, carved and modulated an artistic voice that is altogether present, accessible and obscurely complex at the same time. Capsule cannot wait! Supersonic Festival Ltd Edtn will launch Capsule’s inaugural ‘Labs’ (artist development and commissioning scheme) devised to create more opportunities for commissioning experimental, cross-disciplinary art. More information about this will be coming soon. Legendary musician and artist Bill Drummond will begin a twelve year ‘World Tour’ under Spaghetti Junction marking this momentous event with an exhibition at Eastside Projects. The exhibition focuses on ‘The 25 Paintings’, a series of artworks that signpost actions Drummond will perform across Birmingham during his three month stay in the city including, but by no means limited to, giving away bunches of daffodils, discovering Dead Oak Rings, building rafts, hiding in cafes, making beds, sweeping the streets clean and brewing tea. Also on show will be The SIXTY Posters, The 25 Sixty Second Films, an evolving selection of photographs, a globe of the world and a large map of the city. 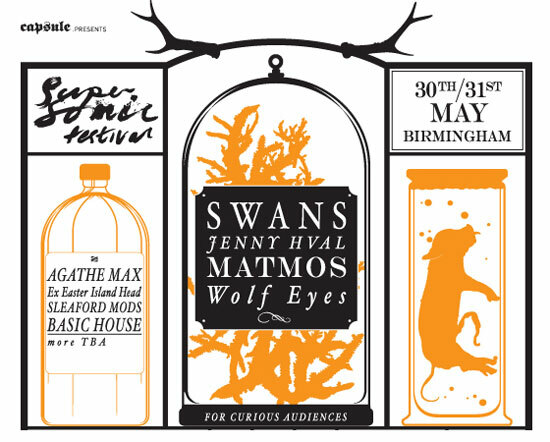 Supersonic Festival Ltd Edtn takes place over the weekend of 30th – 31st May 2014 at the Custard Factory, Birmingham and in the meantime, check out the video below showing highlights of Supersonic 2012. FUTURE NOISE: Paul Catten 'Themes And Variations For Strings And Electronics' Now On Sale!